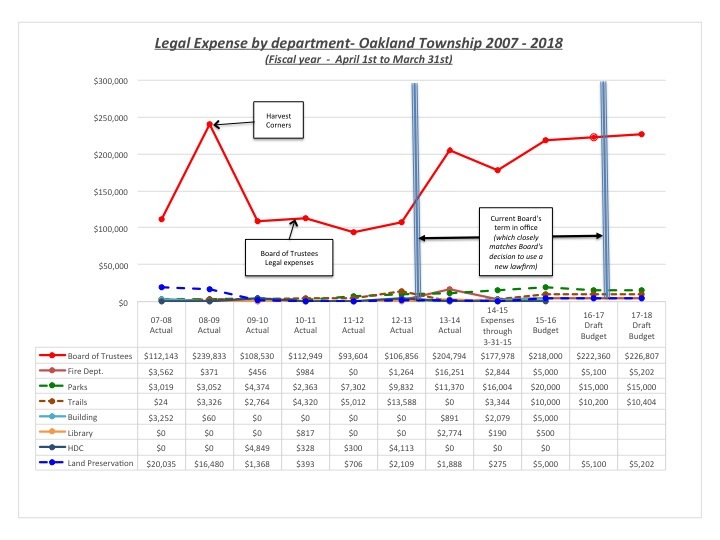 At the July 14, 2015 Oakland Township Board meeting, Treasurer Langlois indicated that the expense for the legal (and possibly the other Township consultant) reviews of development proposals have not been properly allocated to the appropriate escrow accounts. This expense has been included in the monthly $9,000 legal retainer fee the Township Board approved shortly after they came into office. Treasurer Langlois indicated that this discovery might result in changes to the contract that the Township has with the Township’s legal firm. “I found that some expenses for Township reviews have not been passed along to the respective escrow accounts set up by applicants as outlined and required by our current ordinances. I anticipate meeting with our Legal Counsel to request that the billing be modified, or the format of the billing be modified to assist us in properly allocating these costs. Accomplishing this internal fix of our Township expense allocation will actually lower the amount of legal expense being charged to our General Fund, and properly allocating them to the escrow accounts which are funded by applications primarily submitted through the Planning Department. Treasurer Langlois repeatedly referred to this as an internal allocation issue. However, if the cost for the township attorney reviewing development plans was never detailed out as part of the retainer fee, the Township may never have recovered the costs from the developer’s escrow accounts. To do so would have required another ‘set of books’ (or billing statements). How much money has not been recovered from the developer’s escrow accounts since early 2013? The author of this post contacted our previous Superintendent (or Manager) to understand how the legal expense for reviewing developer’s plans were previously ‘booked’. He confirmed that the billing statements from the previous law firm explicitly called out the cost for those services, and were immediately ‘booked’ against the escrow account. All of this changed in early 2013 when the newly elected Board hired the new law firm. Treasurer Langlois, and the other Board members elected in 2012, agreed to the retainer fee approach and the changes implemented at that time. An obvious question remains whether the cost for the legal (& possibly other consultant) reviews were ever ‘recovered’ through the escrow accounts since the new Board took office. We may never be able to identify and recover the costs incurred since early 2013. The recent discovery may just be the ‘tip of the iceberg’ regarding the justification for the higher legal expenses in our Township since the new Board came into office. In the previous post regarding the legal expense issues, the author of this post made several recommendations. They are shown below in the hopes that Treasurer Langlois and the Board consider them to improve the transparency of our Township’s legal bills. Why is this important to the citizens of Oakland Township? It appears that a number of new questions have arisen as a result of the previous post on this subject. It also appears that the recent audit of our Township financials did not discover that our financial processes are not in compliance with our ordinances. Continued citizen scrutiny of what is going on is necessary to make sure we understand how our money is being spent (and if appropriate, recovered). This entry was posted in A new kind of "Transparency", Board of Trustees, Legal Problems and tagged Gonser, Jeanne Langlois, oakland township, Oakland Township Board, Supervisor Gonser, Supervisor Terry Gonser, Terry Gonser, Transparency on July 17, 2015 by richardjmichalski. The legal bills, the fleecing of the taxpayers and the lack of transparency in not including the legal invoices in the packets for the residents to see, was final item I brought before the board and the public before I read my resignation. Mr Kelly (and Terry Gonser) have NO legal right to keep these invoices from the public, under LAW, they ARE NOT privileged information, PERIOD! I started to challenge the legal bills once the first invoices were issued, but to no avail, due to lack of support from the majority of the board, at that time, with the exception of Sharon McKay. This indeed is just the “tip of the iceberg” and has been going on for far too long. As a first time viewer of this site, I would like to thank Mr Michalski for his work on behalf of the township residents. The reporting of legal costs from the township law firm appears quite poor to say the least. While the transparency issue is concerning, the apparent lack of trustee awareness regarding appropriate cost control/reporting is troubling. I’m not sure how the elected officials effectively make and review decisions when they have incomplete data. Thank you Charlie! There are still many questions that need to be answered by the Board.